bah! stop putting up new posts at my 1:45 am! you're distracting me from the sleep i so desperately need! How about a slight addition to that as well, be able to select Range from km/au with a radio button ? Yes, and distance measured in AU, not KM please. while we're at it, can we make it so clicking on a location on the slider moves the tick there, rather than needing to grab and drag? Grab and drag while on the hunt is a draaaaag. Yeah that would been great instead of redoing the pretty much functional probing system. Hope this goes through! Good suggestion, but I'd hard-code it to move in 1 AU increments. After all, that's how we tend to use it anyways, right? I tend to have it on 360°, range set to a few kilometres short of the nearest static object (planet, moon, POS). Prey use the d-scan just as much as the predators. How about also adding a cycle timer, so that the scan pings automatically every x-number of seconds? Having to manually spam that "scan" button every few seconds is frankly ridiculous and incongruous with interstellar spaceship technology. And how about fixed percentage increments instead of an impossible to use log scale like the angle is now? i wish there is a like button for this ! Why not go all the way with the mock-up and include the other features everyone wants? Specifically: (1) the option to use either km or AU for distances, (2) a "logarithmically" scaled slider so it's easier to slide from, say, 5 to 15 degrees rather than have the entire right half of the slider wasted. That seemed so natural that I tried to close the fake window 6 times. I like it. CCP hates you now cause you just made them have to actually consider it. Functionality though, simplicity at its best. Its good. How bout if the slider was dual scaled in Mkm and AU? Then you'd also hit another of the requests. Why km? Why not in Au? +1000 but the range scale should be in AU, at least for the larger end. Also, the tactical overlay needs a range scale in the Z (vertical) axis, not just on the X-Y plane. The slider on the Distance would be nice, the text box on the angle is just clutter. Glad to see that finally parts of numerous improvements developed over the years in functional analysis and design are being used. Add IDs to the list and make it possible to filter out what you don't like to see again on your scanner! I really wanted to reply with "This ^" but I think posts like that are dumb. In that case, let's just say I completely agree with this. I shouldn't have to convert AU to km in my head when using the d-scan. Far too functional Jester. I foresee a radial menu instead. Stop making eve dumb! Okay, there are certainly areas that can be made more intuitive and user friendly (corp mgmt...) but a move toward intuitive and user friendly doesnt (and imo shouldnt) make the game do it all for you. One of eves best features is the learning curve. Having to learn (or at least approximate) km-au equivalents, or understanding the relationship between the various available speeds on your overview and their relationship to tracking, while it does make the game a lot more learning intensive, also makes it that much more immersive. This is an intelligent, deep and extremely incolves gaming experience. Make the scale logarithmic too, so the difference between 5 and 15 degrees is more than the movement of the mouse when clicking the mouse button. Still more important would be the ability to select a different overview profile for the D-Scan than you have for your overview. i.e. 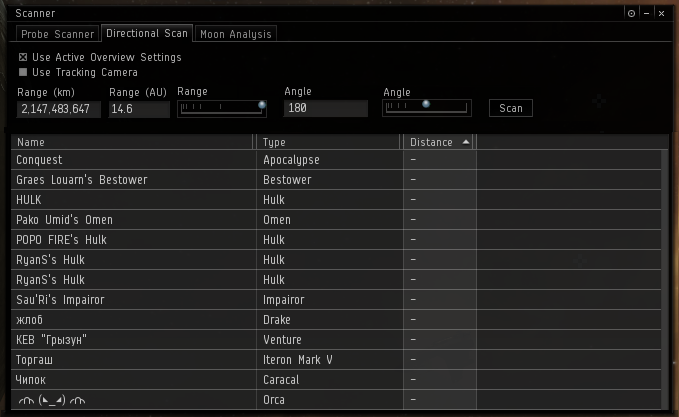 Overview = what I am doing, D-Scan = what I am worried about. This is on the CSM reasonable things list already. And savable settings e.g. 360 @max, 30deg @100,000 km, etc ?